Hattie is a 6 year old Boxer and damaged her cruciate ligament, an injury sustained by a lot of Boxers, approximately 2 years ago. She has a heart condition and also suffers with pancreatitis so a big operation to correct the damage would be very risky for her, and she can only have certain painkillers. 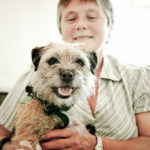 We were referred to Barbara by our Vet and I have to say I was very sceptical before we went. 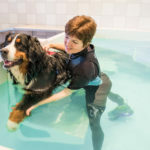 On our first meeting Hattie was unable to put her hind leg to the floor, let alone take any weight on it, Barbara assessed her and set up a programme of land and pool based treatment, along with exercises to do at home. 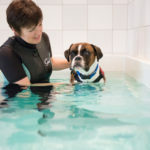 I was totally amazed at the almost immediate improvement in Hattie after just one session and as the weeks went past she got better and better, to say Barbara has saved her life is not an understatement in my view and I am a total convert to her style of treatment, not to be confused with random swimming at some hydrotherapy centres. 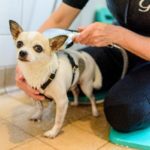 Hattie had a maintenance programme coming monthly or so for a while and as I really feel it is beneficial and helps keep her whole body fit and well. Hattie now walks with all 4 legs and doesn’t even have a limp, occasionally she has pulled the cruciate ligament by basically being a loony Boxer, but because Barbara has worked so hard on the muscle structure around the joint a bit of cold compress, rest and trying to keep her calm (not easy!) for a few days and she is back to normal. I can’t recommend Barbara and K9HS highly enough, she is very professional and knowledgeable, the centre is always spotlessly clean, and best of all Hattie loves coming for treatment and is able to enjoy a normal and happy life.